Gorgeous waves are the perfect look for summer, but achieving them isn’t always as easy as it looks. Until now. TRESemmé has created a collection that makes styling your hair into tousled waves and soft, cascading curls effortless and simple. The new TRESemmé Perfectly (un)Done Collection is a complete range of both wash and care and styling products designed to help you achieve the most-wanted waves – Boho, Beach and Hollywood. Create effortlessly natural-looking waves that last all day. How does it work? 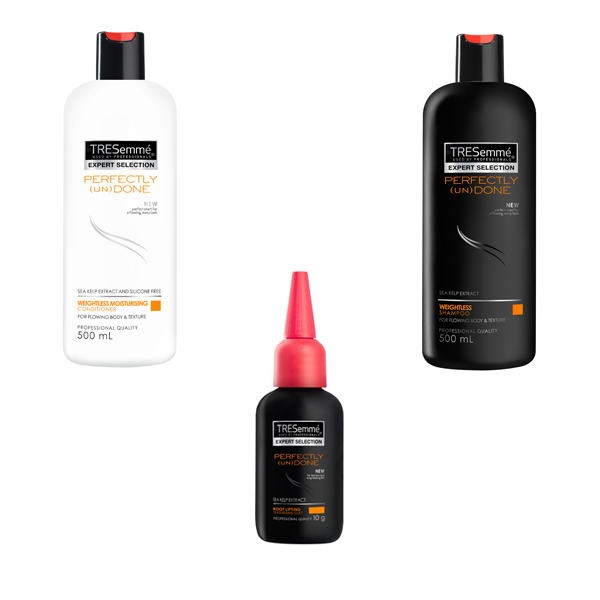 The unique silicone-free shampoo and conditioner contain lightweight polymers to cleanse hair of buildup and provide light conditioning where needed, without weighing your strands down. The styling collection contains everything you need to create a long-lasting Perfectly (un)Done look, including Perfectly (un)Done Wave Creating Sea Foam, Sea Salt Spray and Root Lifting Texturising Dust. Each product is infused with sea-kelp extract, which works with the hair’s natural shape and movement, allowing you to achieve the effortless wave of your choice. Finally, finish your style with the Divine Definition Spray for added texture or the Ultra-Brushable Hairspray for lasting hold with flexible control. So what are you waiting for? Make waves and turn heads for all the right reasons! TRESemmé Perfectly (un)Done collection is available to buy in Asda, Superdrug and Tesco stores nationwide.